The best time to visit Las Vegas is the last week of April through the second week of May. The pools are open, and the Spring Break crowds have left, but the summer crowds have not taken up residency by the pool. The weather is perfect for reading a book and working on your tan while relaxing with a cocktail, poolside. Planning on visiting during another time of year? Read on for our month-by-month guide on when to visit Las Vegas. Las Vegas has a dry, desert climate with scorching hot temperatures during the summer months. High temperatures of 105 degrees Fahrenheit—or more—are not uncommon! Spring and fall are slightly cooler, with highs ranging from an average of 69 degrees in March to 82 degrees in October. Meanwhile, winter in Las Vegas can be quite pleasant: Even in January, the coldest month, the mercury almost never dips below freezing. Snow is not an issue here! While Las Vegas is busy year-round (especially on weekends), the city is buzzing during the week between Christmas and New Years, as well as later January when many conventions come to down. Fall and early spring, when temperatures make for more bearable weather, also can draw crowds. January starts out with New Year's Day festivities and then keeps right on going with football fans coming in strong on the weekends. The colder months seem to be better for midweek travelers, and aside from the first week of the month, room specials can be found. However, you should know that convention season starts up big after the first week in January, so be prepared for an excess of business travelers. Temperatures are usually mild, in the mid-50s. The famous Consumer Electronics Show brings nearly 200,000 people to the city every year in early January. Thanks to the Super Bowl and Valentine's Day, February is a favorite month in Las Vegas. Midweek is less expensive and crowded, but like January, many conventions call the city home during the winter. Good deals are found especially if you avoid the weekends. The pools are not an option yet, but February is a great time to hit the golf courses. Super Bowl weekend is always popular in Las Vegas. Expect great watch-parties and nightclubs packing with celebrity guests! Book early if you're planning to head to Vegas for Valentine's Day—hotel prices can skyrocket. This is March Madness season—in more ways than one. While the NCAA Tournament draws sports nuts, it's also Spring Break season. Get ready for an influx of college students, but surprisingly, costs aren't excessive. You‘ll find spring break specials as well as happy hour specials at most of the resorts. College kids don’t have that much cash, so you have to entice them to come on in. If you like the party atmosphere, weekends are best during late March. NASCAR usually comes to Vegas in early March for the Monster Energy NASCAR Cup Series. Thousands come to Vegas every March to wager on the NCAA March Madness basketball tournament. If it's relaxation by the pool you seek, April is a great time to visit. The weather is excellent, with average high temperatures hovering around 75 degrees Fahrenheit and most of the college visitors are back in classes. Convention season also dies down around this time. CinemaCon, held at Caesars Palace, brings in movers and shakers from the movie industry. Taste more than 500 different kinds of beer at the Great Vegas Festival of Beer, with food pairings to match. Summer season in Vegas starts in May, as the pools start getting crazy and Memorial Day parties take place all month long. Midweek in May is a fabulous time to visit, and you'll likely be able to find tremendous deals early in the month. By the end of the month, prices will go up and weekends can be much more expensive. Vegas pool parties heat up again in May, especially over Memorial Day weekend. Expect celebs and top-ranked DJs galore at these hotel oases. As kids get out of school, the splash factor goes way up in those chairs right near the water. Midweek will see a lot more people, and some of the peace gives way to more traditional day and night Las Vegas fun. Hide out at the Bellagio pool or in one of the smaller pools at Palazzo Las Vegas. It’s hot, but it is not mid-summer hot yet, with high temperatures averaging 100 degrees Fahrenheit. July is the hottest time of the year, but also one of the best months to find deals. The pools will be crowded with every type of visitor from the families to the party people, and there are no shortages of small swimsuits or cocktail specials. If you don't mind heat or crowds, July is a fun time of the year to visit. Professional basketball's NBA Summer League comes to Vegas each summer; you can see the NBA's top talent and some up-and-coming young players. The World Series of Poker runs for two weeks in early July. Put your game face on. It always feels warmer in August even though the weather very similar to July: High temperatures average around 105 degrees, while lows are in the mid-70s. In August, the crowds thin out near the end of the month as kids and their cannonballs go back to school. It is not unheard of to find a remarkable deal at the end of the month and to find a pool without a mad rush of people seeking lounge chairs. Prices are still excellent, and people are generally still having a lot of fun in the day life and nightlife arenas. 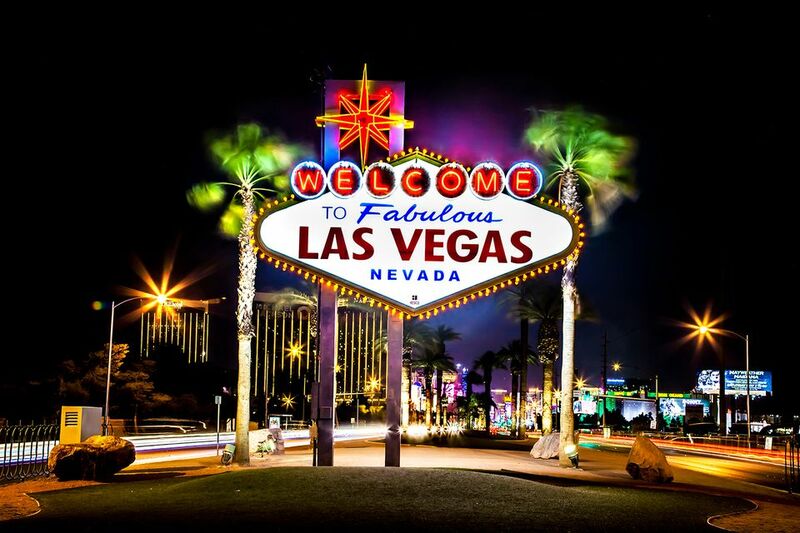 Each August, Vegas hosts, MAGIC, the world's largest fashion marketplace. More than 80,000 people attend to see the latest trends in apparel and footwear. Def Con, the world's largest hacker conference, usually comes to town in August. September is another great time to visit Las Vegas, as mid-week prices are great and the pools are relaxing without the crazy heat. Walk the Strip in comfort and have a seat on an outdoor patio while you sip handcrafted cocktails. If you need to relax, September is as good as it gets. Vegas's Life Is Beautiful music festival takes place in mid-to-late September. In 2018, performers included Arcade Fire, Florence and the Machine, The Weeknd, Travis Scott, N.E.R.D., and more. October can be a bit of a crazy month in Las Vegas: Prices are expensive, and somehow Halloween seems to flow right into Thanksgiving. The parties are great but there are many crowds and convention season is picking back up again! Also, many hotel pools will close in October. Going on for more than 20 years, the Fetish and Fantasy Ball at the Hard Rock is an October must-do. This Halloween extravaganza features DJs and performers and more. Even the Mandalay Bay's Shark Reef aquarium gets into the Halloween spirit, transforming into an eery haunted shark reef for a few days every October. November marks the start of the holiday season and the possibility to wear a nice sweater, as temperatures have retreated into the mid-60s. Restaurant menus are celebrated during the fall season because the talented people in the kitchens of Las Vegas start breaking out the rich, hearty dishes that are put away during the warmer months. Midweek prices are excellent during this time of the year and stay this way throughout December. Enjoy a grand holiday feast on Thanksgiving day, when Las Vegas restaurants offer decadent meals, ranging from classic buffets to modern gastronomic experiences. December is an excellent month for Las Vegas deal-seekers. The weather is much colder, and the crowds are thin. Meanwhile, holiday displays are everywhere, and if you love the lights, you’ll spend plenty of time taking it all in with fewer people around to ruin your pictures. New Year's Eve in Las Vegas is one of the largest celebrations in the world, second only to New York City. Nearly a half-million people flock to the Strip to celebrate. Is June a Good Time to Visit Las Vegas?